From left: Jessica Morthorpe, Chair of Church Council Jenny Barnes and Rev. Rod Pattenden. Left: Rev. 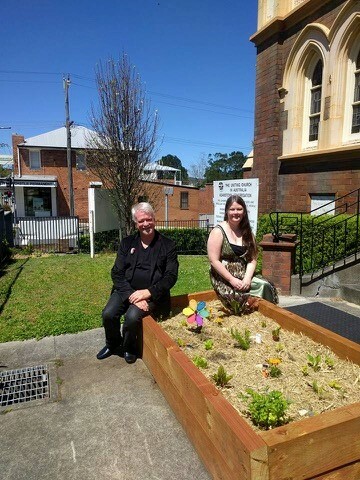 Rod Pattenden (Minister of Adamstown Uniting Church) and Jessica Morthorpe (founder of the Five Leaf Eco-Awards) with the new Messy Church Vegetable Garden. 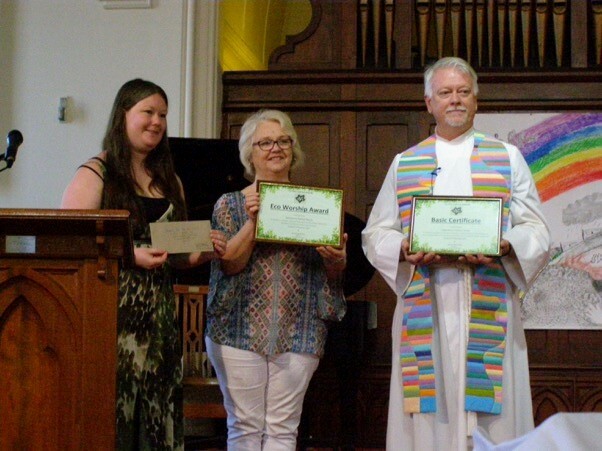 Adamstown Uniting Church (known to many as ‘the pudding church’) was presented with two prestigious Five Leaf Eco-Awards on Sunday, one of only 27 churches in Australia to have been recognised by the program for their environmental achievements. Adamstown Uniting Church was recognised for completing a range of environmental actions including energy efficiency measures and holding creative environment themed worship services such as their annual Sustainability Sunday event, which incorporates discussions about ethical purchasing, Fairtrade products, recycling and power use. Five Leaf Eco-Awards founder Jessica Morthorpe travelled to Newcastle to present the awards to the Adamstown Uniting Church community. “I particularly love the idea of Rev. 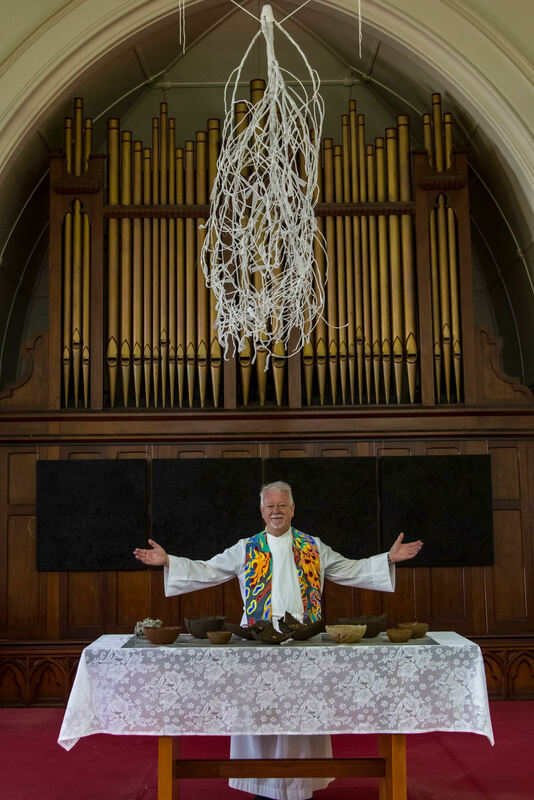 Rod’s creative stoles, including the one made from plastic bags and his growing stole – which has small pockets containing plants in it, making him a ‘walking garden’ and a living symbol of our call to care for the earth,” Ms Morthorpe said. The church was also recognised for their ‘Ecotheology and the Arts’ and ‘Ecological Eye’ art exhibitions, Messy Church Vegetable Garden, the ‘Love of Creation’ lecture series led by Di Rayson and their focus on sustainability, food justice and the environment at the recent Inspiracy Festival. Ms Morthope said she was excited by the church’s new and ongoing environmental projects, and their budding partnership with a church in the climate change affected Pacific nation of Tuvalu. “I hope to be back soon to present more awards,” she said. Adamstown Uniting Church was presented with its third prestigious Five Leaf Eco-Award on Sunday 20th of May 2018 at the conclusion of its four-day sustainability festival, Inspiracy. The church received the award for its environmental outreach work, including fundraising for UnitingWorld climate projects in the Pacific, working to increase the sustainability of their Pudding Kitchen operations and for the Inspiracy sustainability festival. Inspiracy 2: A Climate for Change ran from Thursday 17th to Sunday 20th of May, at Adamstown and Mereweather Uniting Churches. The festival included a vast variety of approaches to sustainability, climate change and justice, including an art installation by Dr. Penny Dunstan titled ‘Dirt, Soil, Earth 2018’ (featuring soils collected in the Upper Hunter Valley from farms and post-mining sites); a Youth Social Justice Film Competition, with winning entries shown on Thursday night to an audience of over 170 local young people; a full day of conversations in environmental theology, including academics and speakers from Melbourne, Sydney, Bellingen and the Pacific; a keynote by Phil Glendenning, President of the Australian Refugee Council on Woking for the Common Good; workshops on climate justice, poetry as activism, raising ethical kids, community gardens, pathways to change, sustainable living and advocacy tools; vocal workshops with songwriter Trish Watts, a book and poetry launch, spoken word poetry by African born poet Roje Ndayambaje and exquisite music by Luke Vassela, Rachel Collis and dancing with Berias Masseque and the Afro Fusion Band. Not to mention the great food!